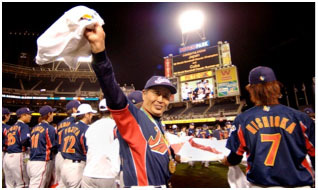 TOKYO – Sadaharu Oh – baseball legend, worldwide sports figure and national hero of Japan – has been named a global ambassador of the eight-nation 2014 IBAF Women’s Baseball World Cup that will be contested from 1-7 September in Miyazaki, Japan – where baseball and softball are spectator-favourites and the national sport. The world’s home run king will also serve as Senior Adviser to host Baseball Federation of Japan to offer his support in the promotion of women’s baseball and to help generate greater awareness of the world championship baseball event that provides a global platform and pathway for women athletes around the world. Oh holds the world-record across professional leagues for career home runs with 868 and played his entire 22-year career with the Tokyo’s Yomiuri Giants of Nippon Professional Baseball (NPB). With Oh’s new role with the Baseball World Cup, he continues his advocacy of the global spread, value and teachings of baseball and softball. During the WBSC’s 2020 campaign last year to return baseball and softball to the Olympics (and ahead of the announcement by the International Olympic Committee that named Tokyo as the host city of the 2020 Olympic Games), Oh voiced his support for baseball and softball’s inclusion in the Games. “I want to offer my support to WBSC’s campaign and strong efforts,” Oh said in Fukui, Japan at the 23rd World Children’s Baseball Fair, which he and fellow baseball hero Henry “Hank” Aaron (USA) co-founded. “If Tokyo wins the honour of hosting the Olympic Games in 2020, I believe baseball and softball competitions will deliver the peak of Olympic sport that capture the full attention of [Japan] and others around the world," Oh stated. The 2014 Women’s Baseball World Cup will bring together the eight National Teams of Australia, Canada, Chinese Taipei, Hong Kong, Japan, Netherlands, United States and Venezuela for a total of twenty-four Women’s Baseball World Cup games. Japan’s Women’s National Team, “Madonna Japan”, is the three-time defending Women’s Baseball World Cup champion and ranked No. 1 in IBAF’s Women’s Baseball World Rankings. Further to promoting women’s sport ahead of the 2014 Women’s Baseball World Cup, baseball officials in Japan also announced the formation of a new governing body, “Women’s Baseball Japan”, which is dedicated to attracting more young women in sport and developing women’s baseball nationally.